It is really easy to do & require very little preparation effort. First, I cut away the head & feet, wash clean thoroughly & fold in the wings. I usually leave the chicken on a rack to airdry in the fridge but you can dry it with kitchen towels. I place the chicken breast-side up on a aluminium foil-lined baking tray in a preheated 175degC oven using the grill function for 25minustes. I then turn over the chicken and grill for another 20minutes. Prepare the chicken – cut away the head & feet, wash clean thoroughly & fold in the wings. leave the chicken on a rack to airdry in the fridge (or you can dry it with kitchen towels). Apply the rub all over the chicken skin & inside. lift the skin (careful not to tear) and rub under the skin. Insert the peeled garlic cloves under the skin (or you can skip this if you don’t want to have dark patches on the skin). Cook the chicken – place the chicken breast-side up on a aluminium foil-lined baking tray in a preheated 175degC oven using the grill function for 25minustes. turn over the chicken and grill for another 20minutes. 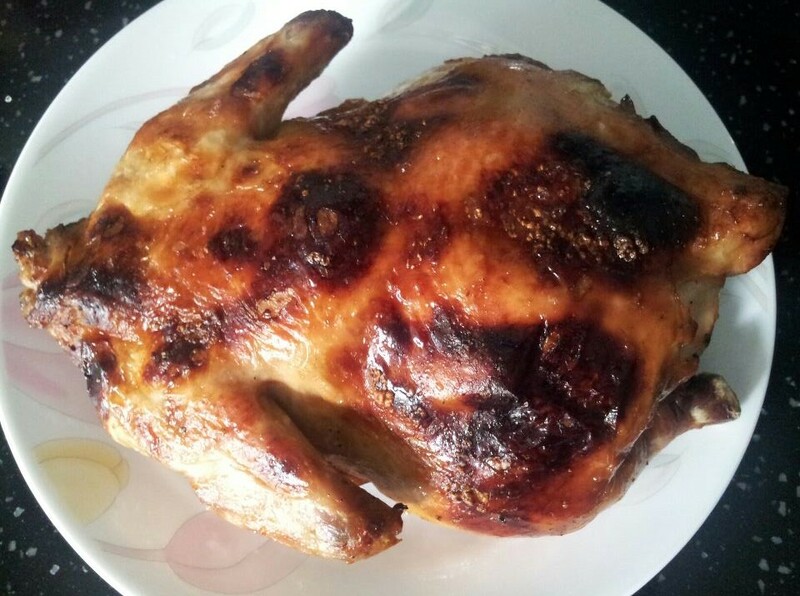 remove from oven & let the chicken rests, and then debone or carve & serve.